The ingredients are mixed with a thoroughly cleaned mixer to create a dough. The dough is shaped on a clean prep table. The formed crusts are baked in a traditional oven that was cleaned beforehand. The crusts are wrapped and frozen and are ready to make. From there, Veloce's staff prepare the pizza. I was informed that they used clean utensils to dress the pizza, and a dedicated slicer once it is fully baked. That being said, there is only one oven in the restaurant, so both gluten-full and gluten-free pizzas have to share space. Gluten-free pizzas are baked on aluminum foil to further prevent cross contamination. As with any restaurant I review, here's where I caution you to make your own decisions about how much of a risk to take when choosing a restaurant with moderate cross contamination. I felt comfortable with the staff's awareness and the protocol, but the decision is yours. 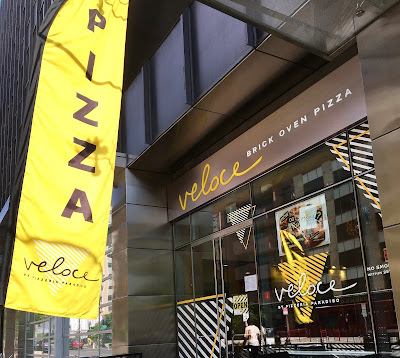 While taking extra precautions, Veloce makes no claim to be 100% gluten-free, and I respect their awareness of the spectrum of gluten-sensitivities. 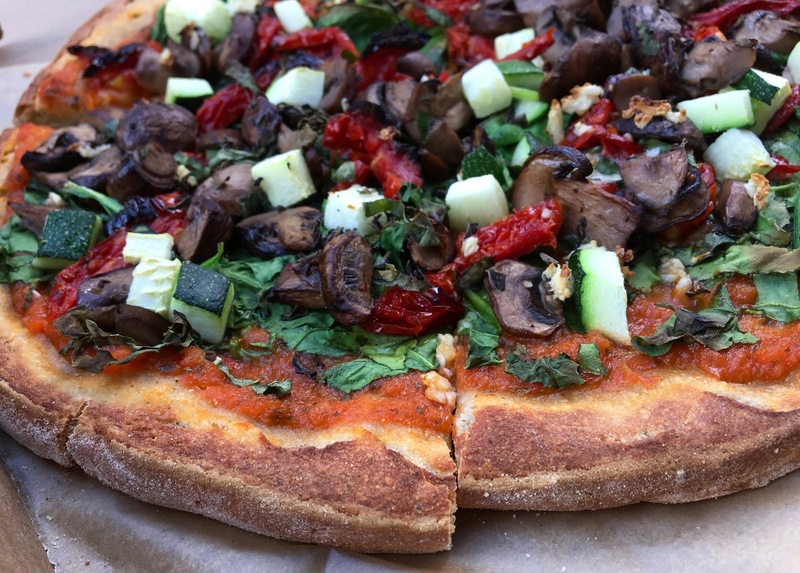 The dough is dairy-free, but not egg-free so it is not considered vegan. 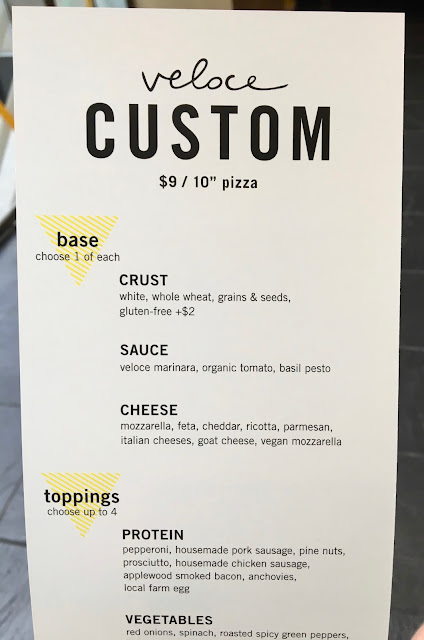 However, if you want vegan cheese that is available on the toppings menu. I am not a fan of vegan cheese, so I skipped it in favor of piling on vegetable toppings. When my pizza was ready, I liked how the box was labeled so I could clearly see my order and the gluten-free labeling for the crust. When my pizza emerged from the oven, I had to check (and double check) that it was actually gluten-free. It looked so "normal," which is the highest compliment I can pay for a gluten-free pizza. 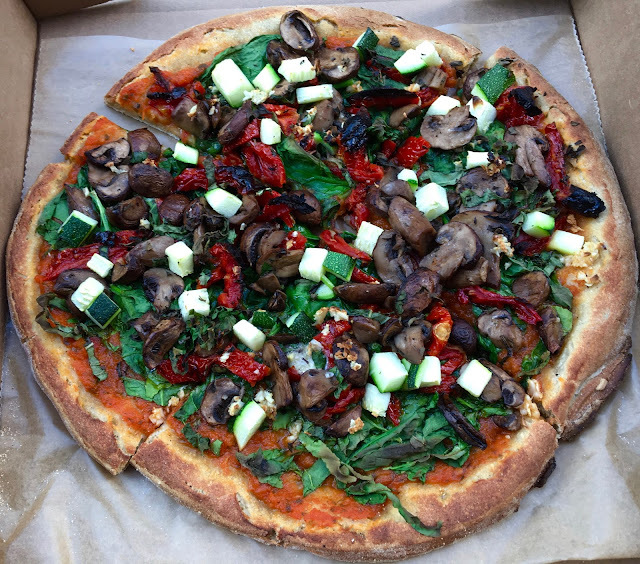 I chose to top it with the marinara sauce, mushrooms, sundried tomatoes, zucchini, and spinach with a garnish of garlic, oregano, and basil. The crust has a wonderful whole grain flavor that is hearty with a note of nuttiness. It's thicker than most "cardboard" crusts, which was greatly appreciated by this thick crust lover. The pizza does a pretty good job of holding up to the weight of toppings, and is a perfect 10" wide. The sauce is tasty and vibrant, and the generous portioning of veggies distinctly fresh. The mushrooms, sundried tomato, and garlic provided most of the flavor, and the whole pizza was supremely satisfying. I have become quite the gluten-free pizza snob in my years since going gluten-free, yet was caught off guard by how good Veloce's pizza was. 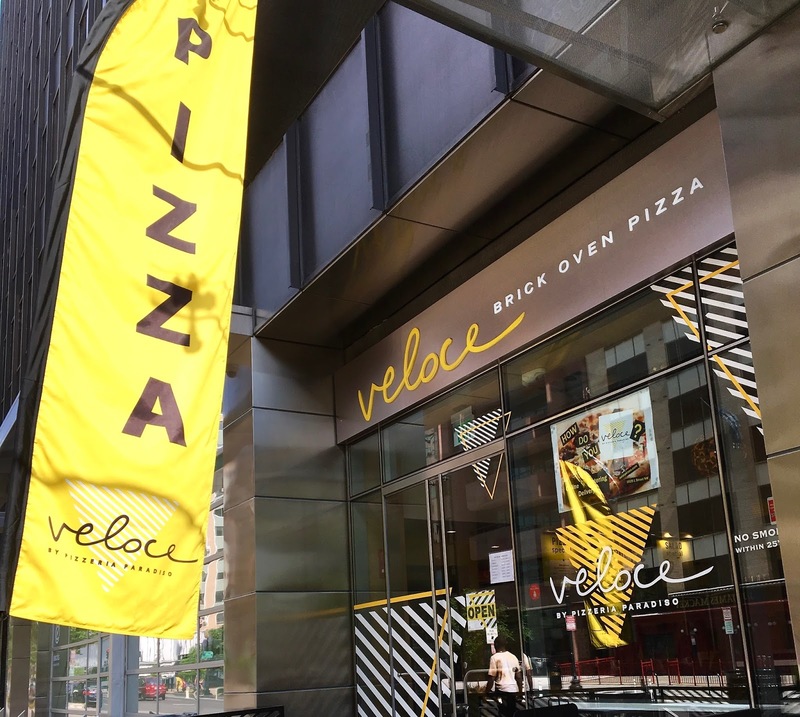 Rarely are fast casual pizzerias able to serve up an affordable, yet high quality gluten-free pizza, so I have to give Veloce top marks across every category.